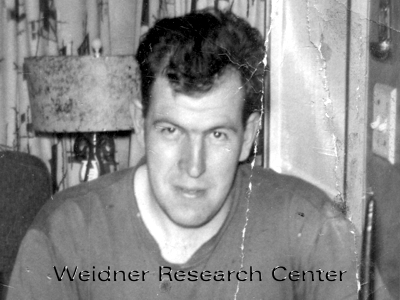 Ralph Lucian Weidner, about 1955. [S256] Stephen Charles Weidner entry, Certificate of Live Birth 600 (23 Feb 1961). [S455] Times, The, 25 Jun 1992, sect. B, p. 4, col. 4. [S672] St. Cloud Daily Times, 22 Jan 1945, p. 5, col. 5. [S1238] Baptismal Certificate, St. Andrew the Apostle Church, 24 Mar 1964, St. Andrew the Apostle Church. [S1239] Baptismal Certificate, St. Andrew the Apostle Church, 24 Oct 1965, St. Andrew the Apostle Church. [S1409] St. Cloud Times, 20 Apr 2017. [S244] Ralph L. Weidner entry, Certificate of Birth 207 (12 May 1928). [S912] Ralph Lucian Weidner, Indiana State Department of Health. [S1240] Baptismal Certificate, Church of the Ascension, 12 Mar 1928, Church of the Ascension. [S244] Ralph L. Weidner entry, Certificate of Birth 207, the home Ralph was born in no longer exists. The I-94 expressway runs through where the home once stood. (12 May 1928). [S912] Ralph Lucian Weidner, Indiana State Department of Health, Birth date, city and state. [S1240] Baptismal Certificate, Church of the Ascension: Birth date, city, state, 12 Mar 1928, Church of the Ascension. [S245] Lake County, Indiana, Marriage Book 158: 517: marriage date only. [S1409] St. Cloud Times, 20 Apr 2017, Listed as deceased. [S862] Margaret Mary Weidner, Certificate of live birth 066945 (29 Aug 1958).